St. Patrick's Day is March 17. Your kids will love these St. Paddy's Day activities. Make a silly leprechaun that moves, find all the words in the word search puzzle, color the leprechauns in the coloring pages, color your own March calendar, and more! For younger students, try this EASY St. Patrick's Day Word search. There are no backwards or diagonal words in this large-print 6x8 word hunt. Perfect for students in 1st and 2nd grade. Find the words hidden in the puzzle. Includes the words shamrock, gold, clover, magic, four-leaf clover, leprechaun, and many others. Students create their own bingo board, then play St. Patrick's Day bingo. To play this game, players search for pairs of connecting numbers that have a sum of 13. These game boards are shaped like lucky four-leaf clovers. Celebrate the St. Patrick's Day by plotting the points on this 30 x 40 grid to reveal a pot of gold at the end of a rainbow. This mystery graph picture is more advanced than the previous version because it also plots out the leprechaun in addition to the pot of gold and rainbow. 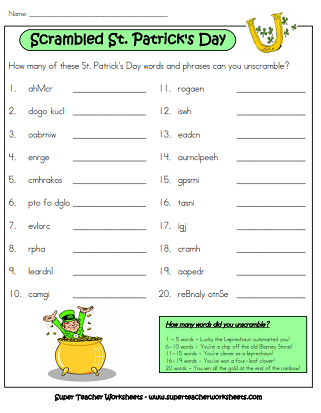 Unscramble the St. Patrick's Day words and phrases on this worksheet. Figure out all 20 words and you'll win the leprechaun's pot of gold! Cut out and rearrange the letters in the word LEPRECHAUN to make as many different words as possible. This primary level worksheet has primary-ruled lines for grades K through 2. Rearrange the letters in the word LEPRECHAUN to make as many different words as possible. This intermediate level worksheet has a scoring system and was designed for students in 3rd through 6th grades. An easy craft for kids. Color the leprechaun, then cut out his body, arms, and legs. Attach the parts together with brass paper fasteners so his arms and legs move. Make a fun headband to wear on March 17th. Kids can color the leprechaun, assemble the hat, and wear it around the school. Cut and fold this mischievous leprechaun cootie catcher for some St. Patrick's Day fun! A seven page booklet with pictures of leprechauns for kids to color. Use these as extra-time fillers, or print them out individually to use as decorations for your St. Patrick's Day writing assignments. Color the March calendar, and fill in the dates for this year. This cute calendar has a picture of a leprechaun holding a balloon. Students cut out 25 word cards. Then they rearrange them to make as many complete sentences as possible. Some cards have basic sight words, such as we, I, she, he, run, will, by, can, and the. Other cards have St. Patrick's Day-themed words, such as grass, gold, dance, rainbow, and leprechaun. Students cut out 5 word cards and rearrange them to make a complete sentence. They glue the cards onto the paper and write the sentence on the line. The sentence reads, "I saw a green leprechaun." This build-a-sentence activity has seven words. Students glue the words on paper to form a complete sentence. The sentence reads, "Do you see the pot of gold?" A cute poem about a friendly leprechaun; Includes comprehension questions. A cartoon pictures a man who has caught a leprechaun. Students write a creative story that describes what happens next. When Jason gets stuck being the leprechaun while playing Leprechaun's Pot of Gold with his friends, he'll have to think like a leprechaun to find the perfect hiding place for the chocolate coins. 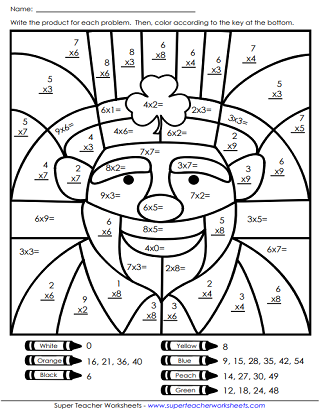 This page has coloring pages and reading comprehension articles for Women's History Month. This article teaches students the legends and history behind three symbols of St. Patrick's Day - shamrock, the Blarney Stone, and leprechauns. This article is written at approximately a 5th grade reading level. Solve the basic addition problems and color according to the key to create a magical leprechaun picture. Complete 20 addition problems (2-digits plus 2-digits with with regrouping). The cut the squares, match the answers, and assemble the leprechaun puzzle. Write the answers to the basic subtraction facts and color the sections of the leprechaun the correct color. Complete the subtraction problems (3-digits minus 2-digits with with regrouping). 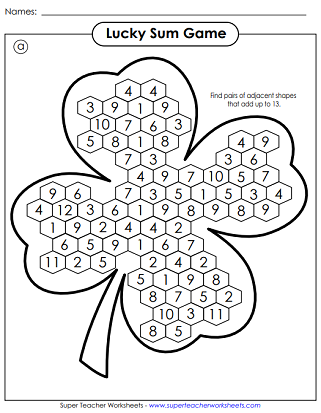 Then create a fun St. Patrick's Day picture puzzle with the answer squares. Solve the basic multiplication facts and color the leprechaun according to the key. Multiply 3-digit numbers by 2-digit numbers. (Advanced level for grades 5 and up.) Then use the answers to complete the St. Patrick's Day Puzzle. Write the quotients in the spaces and color according to the key at the bottom of the page. Color the leprechaun illustration according to the number key. This first grade spelling unit has a word list, ABC order activities, a word unscramble activity, and assessment tools. Printable worksheets with Easter eggs and Easter bunnies. More addition, subtraction, multiplication, and division mystery pictures. Measure capacity, length, weight, and temperature with these worksheets.